Find family-friendly homes near your favorite Atlanta attractions in the Ansley Park real estate listings below! An affluent residential neighborhood in Atlanta, located just east of Midtown and west of Piedmont Park. Located in a top-rated school system of Morningside Elementary School, Inman middle School, and Henry W. Grady High School, Ansley Park is ideal for the whole family. Home to the Ansley Park golf course, the neighborhood is surrounded by numerous parks, convenient shopping, and several exciting restaurant choices - every lifestyle is offered something. This gracious, harmonious neighborhood is active in maintaining its integrity and sense of community. Find out why Ansley Park is one of the most sought-after communities in Atlanta! View all of the listings now or keep reading to find out more about Ansley Park homes for sale and the family-friendly amenities nearby. Diverse in style and scale, the houses in the district represent a full range of eclectic and contemporary suburban architecture. These styles include Colonial, Federal, Neo-Classical, Italian Renaissance, Queen Anne, and Tudor styles, as well as Prairie School and Craftsmen bungalows. As for scale, houses range from one-story cottages to two-story house to three-story mansions and larger apartment buildings. Nestled between the Atlanta Botanical Gardens, Ansley Golf Club, and West Peachtree Street, homes in Ansley Park are just a short walk or bike ride away from several great places to shop, dine, and relax. Several parks pepper the landscape between the neighborhoods here, including Winn Park and Ansley Park. 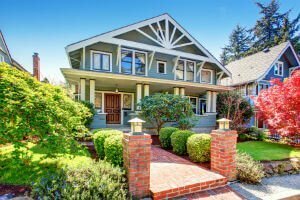 This beautiful haven is so quaint and quiet that you'd never know that its just one block from the bustling streets of Midtown and its endless shopping and dining destinations. Whether its exploring boutique shops to gazing at the beautiful urban landscaping or hopping on the MARTA to catch a game at the Georgia Dome, everything is easily accessible from your home in Ansley Park. For more information about Ansley Park homes for sale or to request a tour of a listing above, get in touch with the John Bailey Realty group now at 770.484.7888.